Ralph Kelley was born May 17, 1950. He was raised in Newbury Park, California by his parents John and Alta Kelley and his grandparents John and Olive Kelley, who were a monumental part of his life growing up with his brothers Bill and John. He has been a resident of Ventura County all of his life and fourth generation to live in Newbury Park. He attended grade school in Newbury Park. He graduated from Camarillo High School. He was in FFA, ran track, and wrestled. Ralph attended Ventura and Moorpark Colleges, where he participated in College Rodeo. He married Barbara Runkle in 1970 and has two daughters, married to Rick Kauffroath and Karen married to Jeff Fontes. He has two granddaughters, Jessie and Jamie Fontes. He worked for Ralph Hays of Oxnard Roofing, but soon realized his passion was working with horses and cattle. Ralph Hays continued to have a major role in his life. He has been a farrier and a cattle rancher since the early 1970’s, shoeing horses for Foxfield Riding Stables for over 40 years. Pat Garrison for 40 years and has made many faithful clients over the years, and learned the trade from mentor and friend Charlie Cantrell. 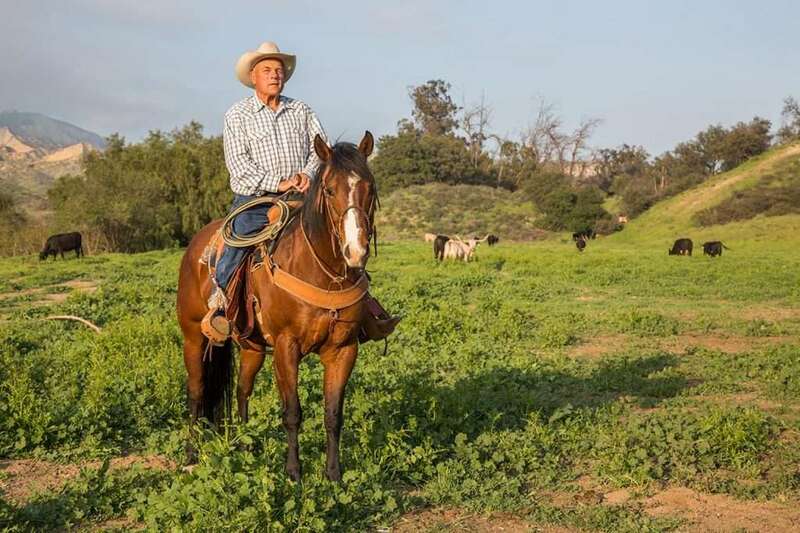 Ralph helped and pastured cattle on many Ventura County ranches. His first ranch job was on the Wood Ranch in Simi Valley for Adrian Wood, who was so kind and generous. He later went on to lease the ranch and pasture cattle for Alex Madonna and Tom Mora. He also helped on Sierra Vista Ranch for Sam Watson, Broom Ranch for Elmer Young, Runkle Ranch for Jim and Ralph Runkle, Strathern Ranch for Bob Strathern, Sence Ranch for John Lagomarsino, and Bridle Path for Les Wilcox. Over the years Ralph has seen most of these ranches develop into communities of homes, parks, and open space. Growing up he has fond memories of gathering cattle and branding calves at Joel McCrea’s, James Arness’, John Varble’s, and Joe Yanez’ ranches. Ralph hauled cattle for fellow ranchers and friends to Buellton Sales Yard and worked for Jerry Williams at the Thursday Sales. He was the 2011 Ventura County Cattlemen’s Association Cattleman of the year. He has enjoyed team roping since early childhood and always looks forward to participating in the Santa Barbara Fiesta and Ventura County Fair. He joined the PRCA at 15 years old and is still a gold card member. He has competed in the Bob Fiest Invitational and the World Series of Team Roping. He still ropes with his longtime team roping partner of 56 years, Gene Agdeppa. Ralph is currently cattle ranching on land leased from Waste Management in the hills of Simi Valley, with help from family and friends. Simi Valley has been his home for the past 45 years. He will continue to participate in as many roping events as possible. Ralph feels blessed and thankful for great memories, family, friends, good horses, and lots of fun through the years.